Investors just pulled money out of stocks at a record pace and, if history is any indication, equities could struggle before recovering. 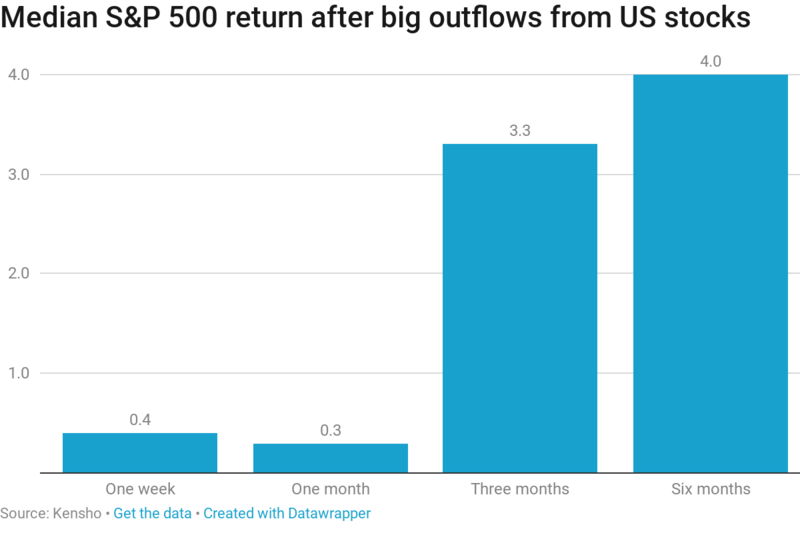 S&P 500 one week after these outflows is just 0.4 percent. Returns a month after are not great either, with the median coming in at 0.3 percent. Stocks start turning significantly higher after three months, the analysis shows. The S&P 500’s three-month median return after these outflows tops 3 percent. The index’s median gain six months after outflows hits 4 percent. Investors are draining money from stocks as Wall Street grapples with uncertainty around the U.S.-China trade war and fears over a possible global economic slowdown. The U.S. and China are working toward striking a permanent deal on trade after agreeing Dec. 1 to a 90-day truce on tariffs. However, experts fear the grace period will not be enough to put together a deal that addresses the issues concerning both China and the U.S. Meanwhile, the Chinese government reported Friday November industrial output numbers that were the worst in four years alongside its worst retail sales growth data since 2003. This led to a sharp sell-off in U.S. stocks on Friday, with the Dow Jones Industrial Average falling more than 500 points at its session low.